Produced using up to 25% recycled material, our Enhanced Polymer chair mat is the most durable Eco-friendly chair mat; allowing you to reduce your carbon footprint whilst providing superior floor protection. The smooth back on this chair mat will keep it in place whilst helping to prevent wear and tear to your hard floor caused by office chair casters or wheels. Whether your chair mat is for the home or office, at Chair Mats Ltd we are dedicated to supplying our customers with the highest quality surface protection to make your everyday tasks that bit easier. Proven to reduce leg fatigue, our chair mats are ergonomically designed with a smooth glide surface to provide easy movement, taking the strain off your legs. We recommend periodically adjusting your chair mat position to prevent the build-up of trapped dust and moisture which can occur in certain environments. Our small size chair mats (30"x48" and 36"x48") are shipped flat and our larger sizes (48"x51" and 48"x60") are shipped rolled. Once unrolled, the chair mat should revert to its flat state almost instantly. ENHANCED POLYMER CHAIR MAT FOR LIGHT/MEDIUM USE 36" x 48" (20" x 10" LIP) - Superior hard floor protection. Suitable for hard floors including: vinyl, hardwood, stone, tile, laminate and concrete. DURABLE SMOOTH GLIDE SURFACE FOR ERGONOMIC GLIDING - This Enhanced Polymer chair mat has a smooth easy glide surface to provide added ease of movement, which is proven to reduce leg fatigue by taking the strain off your legs. 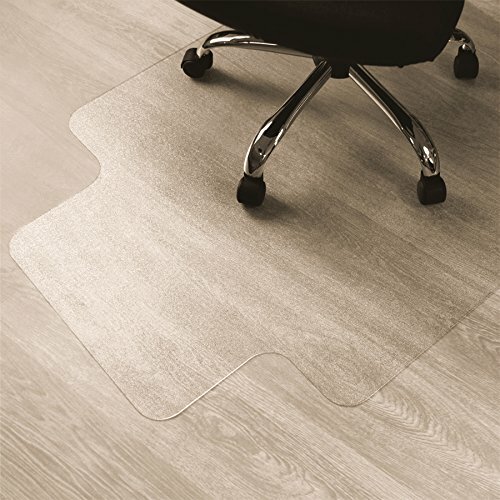 SMOOTH BACK CHAIR MAT - Effectively helps to prevent damage to hard flooring caused by your office chair casters or wheels. ENVIRONMENTALLY FRIENDLY - Produced using up to 25% recycled material, this is the most durable Eco-Friendly chair mat. No Odor, No Toxins, No Cadmium, No Tin and No Lead. SHIPPED FLAT - Our small size chair mats (30" x 48" and 36" x 48") are shipped flat and our larger sizes (48" x 51" and 48" x 60") are shipped rolled. View More In Chair Mats. If you have any questions about this product by Marvelux, contact us by completing and submitting the form below. If you are looking for a specif part number, please include it with your message. RHF EVA Office Chair Mat for Hard Floor, Mat For Office chair, Mat For Desk chair, Mat For Rolling chair-No BPA, Phthalates, Odorless 36" x 48"